Gomoa Central District Assembly in the Central Region has handed over 21 motorbikes to Assembly Members in the district to enable them related constantly with their electorates. 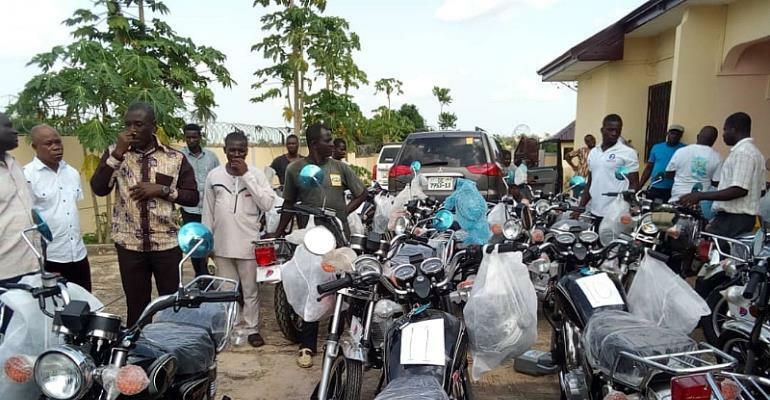 The Motorbikes were acquired by the Ministry of Local Government and Rural Development for all Assembly Members across the country to enable them to visit their communities regularly. DCE for Gomoa Central, Hon. Benjamin Kojo Otoo presenting the keys to the motorbikes called on the Assembly Members to use the motorbikes judiciously in carrying out their mandate to improve social amenities for their people. "His Excellency, Nana Addo Dankwa Akufo Addo led NPP government sought to bring good governance closer to the doorsteps of the people in the District and these motorbikes are means of reaching out to them in their communities. They are not to be used for fun but for you as Assembly Members to reach out to the people. The motorbikes would be the means of transport to interact with people to know their needs. Those of you who have more communities in your electoral areas, these motorbikes would serve you better to have constantly interactions with them. Development is about the needs of the people in individual community. We can only know their needs if we reach out to them. Take advantage of these motorbikes to improve upon your performance for future endeavours. Being integral part of the Assembly, these Motorbikes have been given to your office to carry out programmes and activities of the Assembly to improve the lives of your electorates. Your electorate should be informed about projects and innovations the Assembly is undertaking to better their lives. Most of these information would come from the you as Assembly Member. Government spent a lot to acquire these machines for Assembly Members across the country to use as means of transportation. As I have been saying, the Assembly will continue to discharge its duties delligently to improve the lives of the people in the District . You should therefore use these motorbikes to close the gap between you as Assembly Member and your electorates. We must reach out to areas which used to be neglected due transportation challeges to inform and educate them on Assembly's programmes and policies "
Hon. Benjamin Kojo Otto disclosed that the Assembly was equipping its structures to enhance efficiency.
" We has secured furniture for our Four Area and Town Councils to boost revenue mobilization. Even though they are doing their best there is the need to equip them with materials needed for their operations. When we all join hands in this direction, Gomoa Central Assembly would achieve the purpose for which it was created"
Hon. Kweku Nyarko Koomson, Presiding Member of Gomoa Central District Assembly who received the motorbikes on behalf of the Assembly Members commended His Excellency Nana Addo Dankwa Akufo Addo led NPP government for giving them the motorbikes to facilitate their daily activities. He also commended Minister for Local Government and Rural Development, Hon. Hajia Alima Mahama, Member of Parliament for Gomoa Central Constituency, Hon. Naana Eyiah for facilitating the release of the Motorbikes to the Assembly Member to the relief of burden associated with transportation in their operation areas. "I want to take this opportunity to assure our hardworking DCE, Hon. Benjamin Kojo Otoo that the motorbikes would be put into good use and would be properly taken care of to last even longer than expected."